Finding words for prayer can be tough. However, using the prayers of the church can help us find our own words. “The grace of God is beheld noetically (through the spiritual intellect) and is known by the perception of the nous (the spiritual mind) during prayer. There are many ways to pray. All of them are good – if one does not know any better and prays with simplicity” (The Letters of Elder Joseph the Hesychast, Sixty-Third Letter). 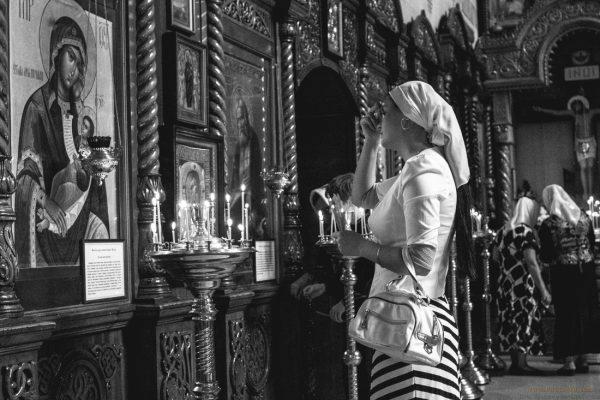 There are many beautiful prayers in the Orthodox tradition. Many of them can really strike at the heart. Some prayers bring me to tears, while others lift my soul into heaven. Other prayers bestow a joy so deep that it can only come from Christ. It’s easy to join our voices to the prayers of vespers, matins, or liturgy. It’s easy to open a prayer book and read the prayers found there. In fact, there are many good prayer books to choose from (here’s one that I really like). But sometimes we need to form our own prayer from the heart. Finding the words can be tough. So I want to share a quick formula for how many of our Orthodox prayers are structured. First, there’s the anamnesis, then there’s the epiclesis. You’ll notice that many of the Church’s prayers first remember what God has done. Usually, it’s a story from the Bible. Then they ask God to do again what he once did. You see, it’s a remembrance of what God has done in the past. Now we ask God to do that again. So in the first part of the prayer we get the story of how God blessed Isaac with Rebecca, and then, in the second part, we ask God to do the same for the couple getting married. I encourage you, if you are looking for words of your own in prayer, try this formula: anamnesis then epiclesis. In addition to helping us find the proper words, praying in this manner will help us learn Scripture better, and we’ll be uplifted by the marvelous acts God has performed throughout all history. As God has heard the prayers of all his saints throughout history, may He hear ours now!